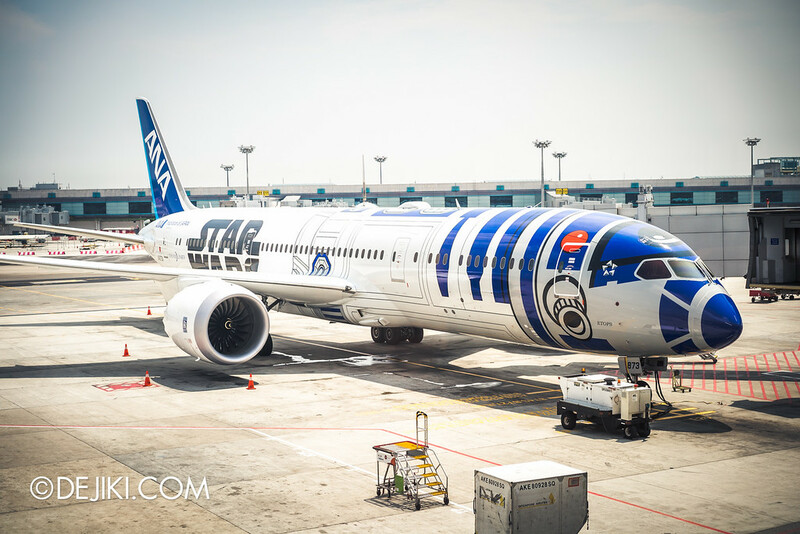 As part of the launch of Star Wars at Changi, the media visited the R2-D2 ANA JET. 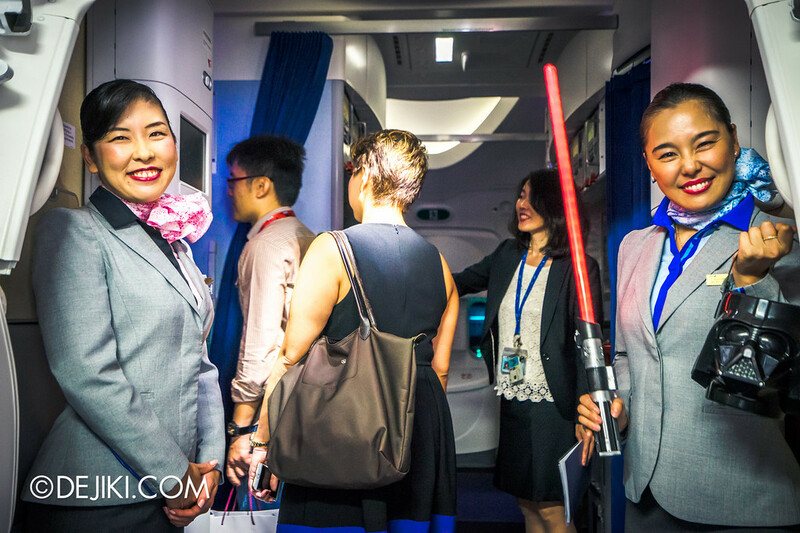 The plane is specially chartered by JTB as part of a special tour package – so there’s a group of Japanese tourists who also attended the Star Wars at Changi launch. Maybe they are visiting Universal Studios Singapore today. 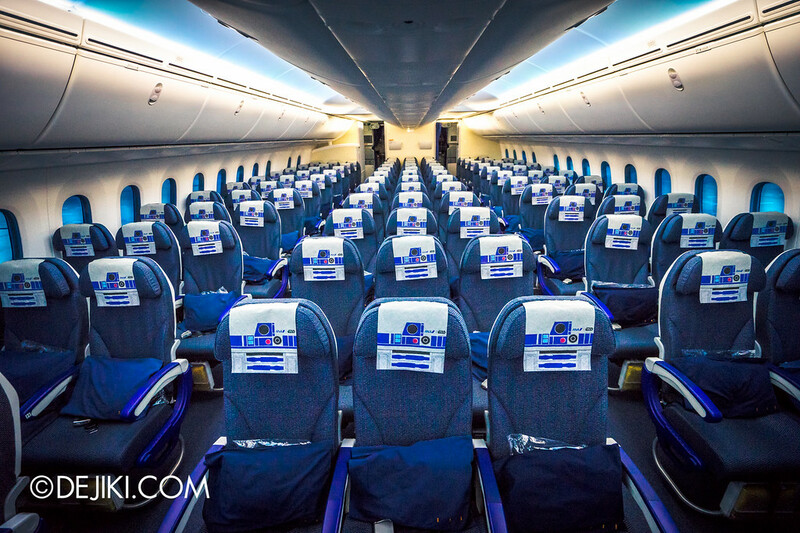 For Singapore, the highlight would be the exclusive ANA JET experience that 30 lucky winners will be able to enjoy on 14 November. Not for the rest of us, though we got to tour the plane. That’s quite awesome anyway. Thanks to Changi Airport and ANA for hosting us! Changi Airport’s Gate E26 at Terminal 2 has a special makeover. 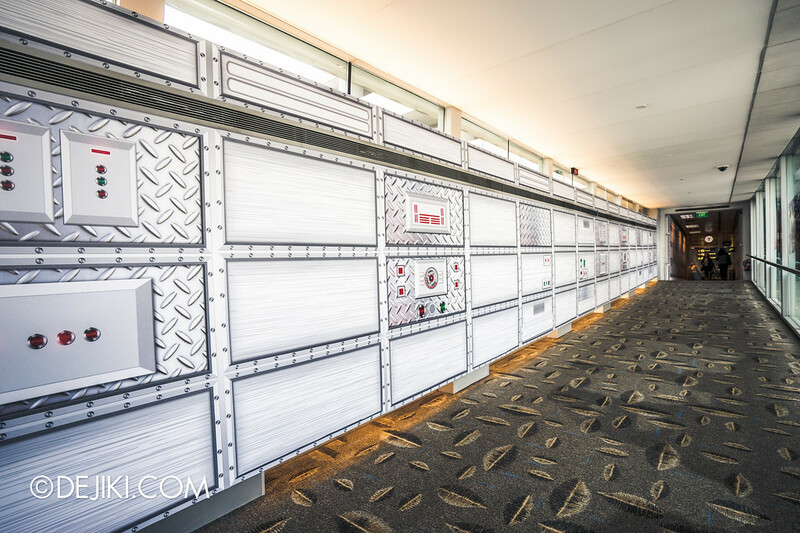 The Gate holdroom has similar walls as well. 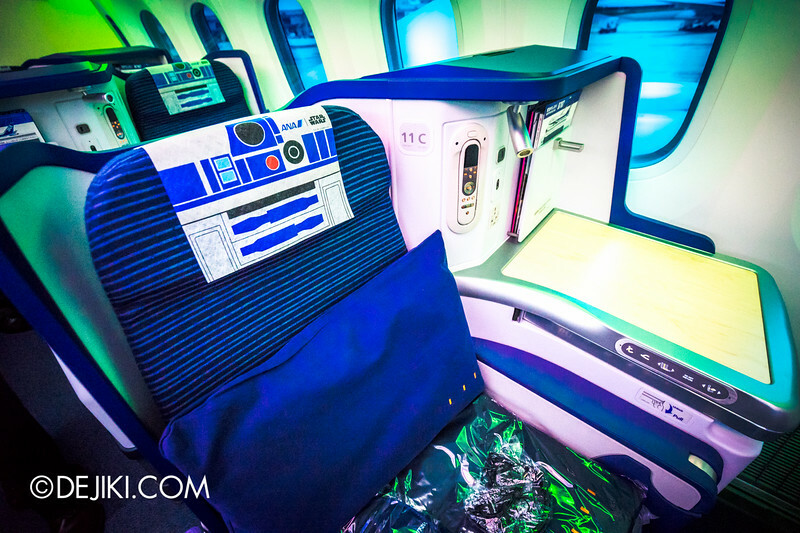 Business Class cabin inside the R2D2 ANA JET. 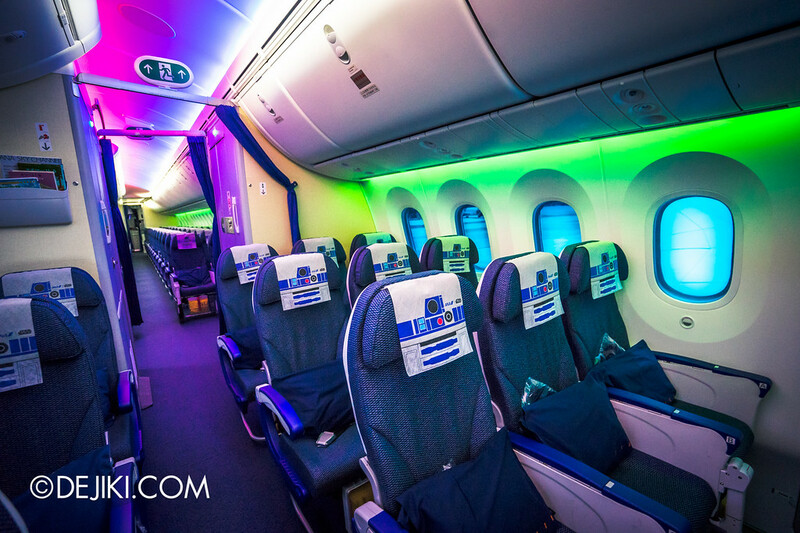 It’s a B787 Dreamliner. Spotted any droids yet? We saw Yoda..? 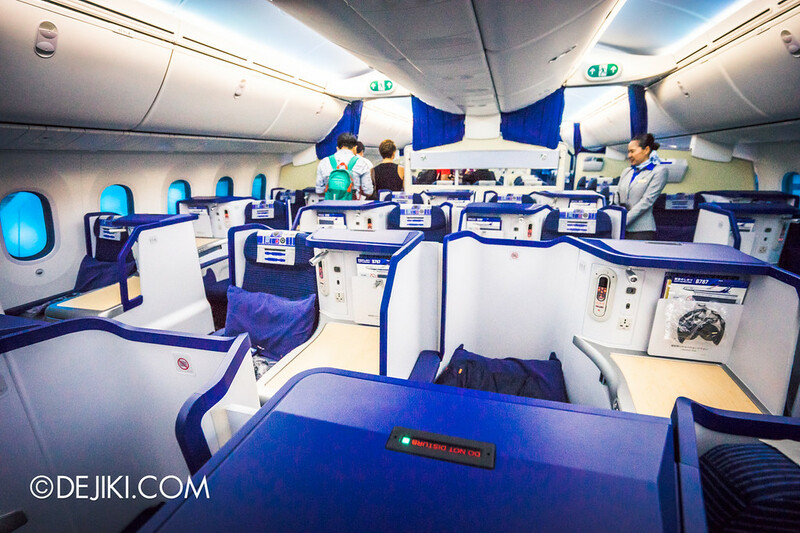 Relaxing in Business class seat, we see. Jedi Master mah. Apart from the napkin and paper cup, the rest of the setting is standard ANA. 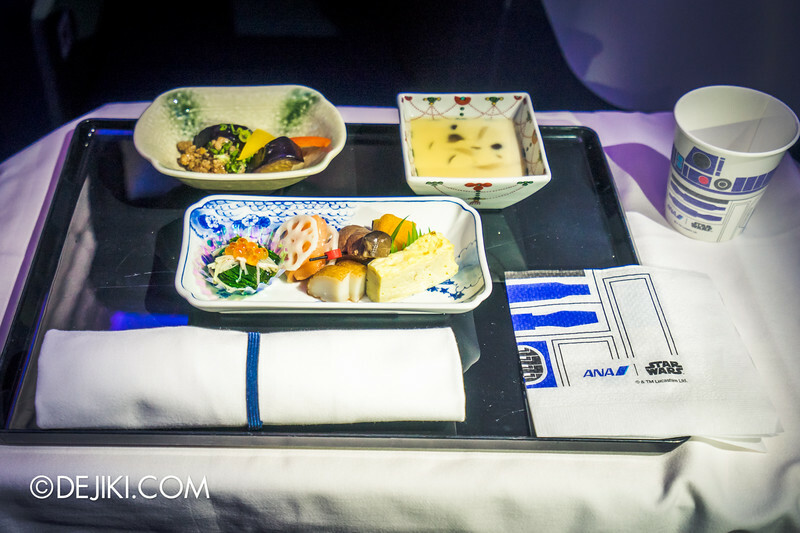 Overall it’s quite modest as far as themed flights go; those who were traumatised by the EVA AIR Hello Kitty Jet experience can heave a sigh of relief, because it’s ANA with a thematic touch, not an ‘attraction’ of its own. 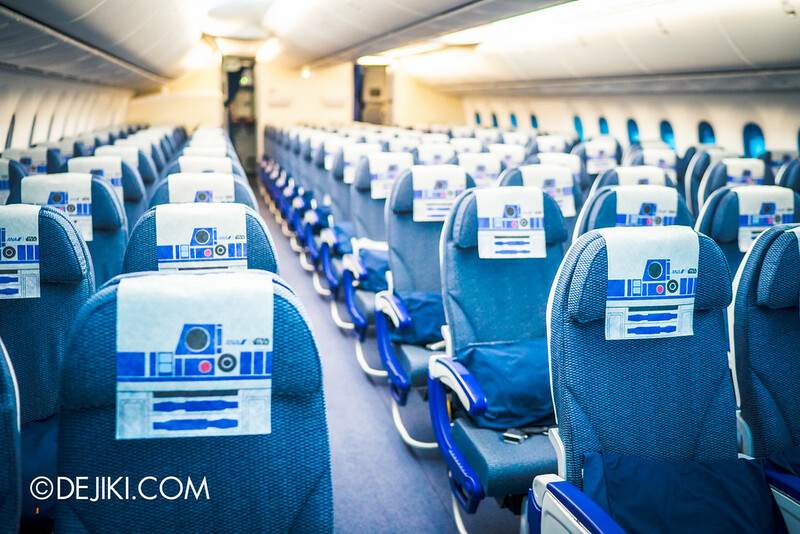 The cabin uses R2-D2’s signature beeps (instead of the usual bell tone) for announcements. 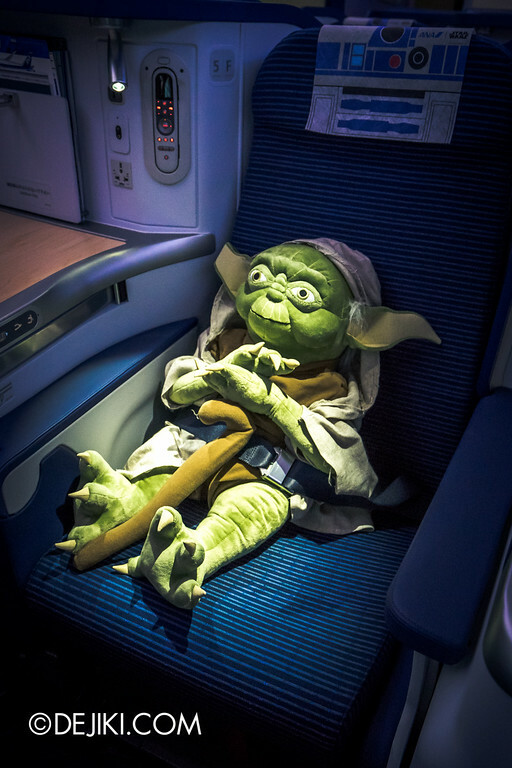 We heard music from the Star Wars films instead of the ‘easy listening’ music playing in the cabin. Maybe the Star Wars Theme used in the films’ opening crawl is played when the plane takes off? Seeing all these lights dancing with sound effects from Star Wars remind me of Star Tours: The Adventures Continue at Tokyo Disneyland. Maybe it’s time to plan a trip to Tokyo. 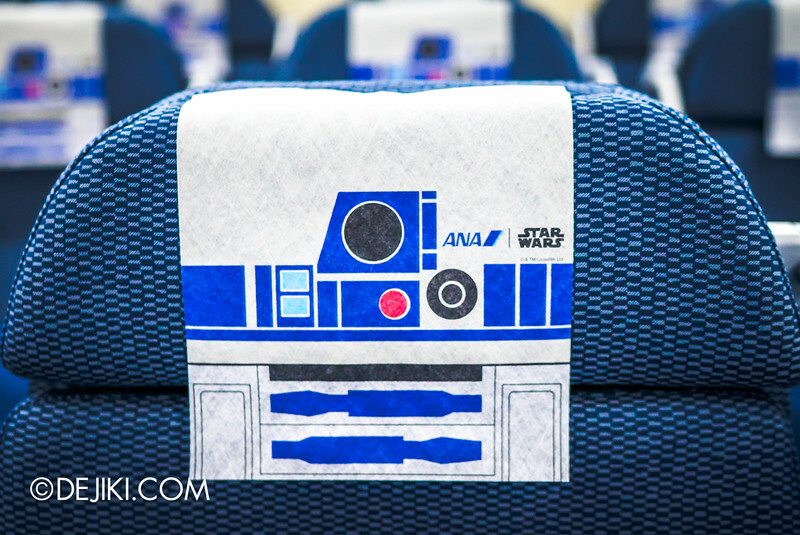 The most visible theming are these R2-D2 headrest cover sheets. Just look at the number of them! 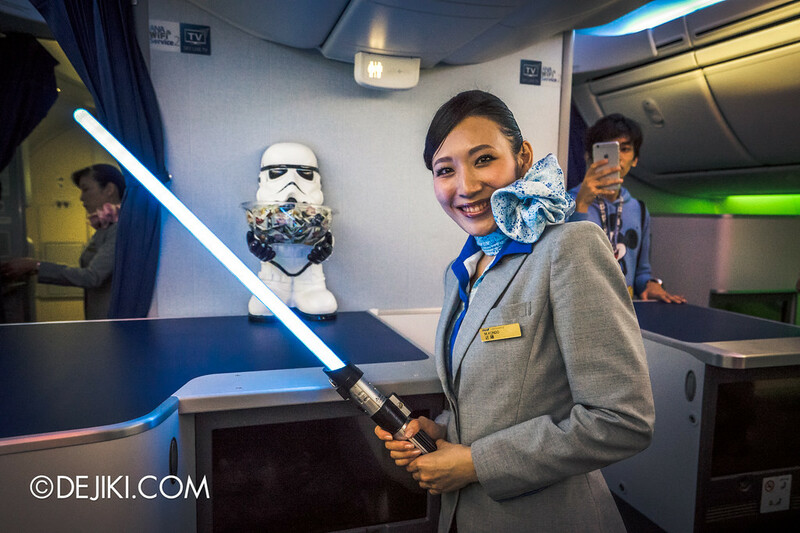 And no, the cabin crew isn’t going to be dressed as Stormtroopers, Jedi Knight, Princess Leia, or Padmé Amidala’s handmaidens. It’s the same sharp, fashionable ANA look. 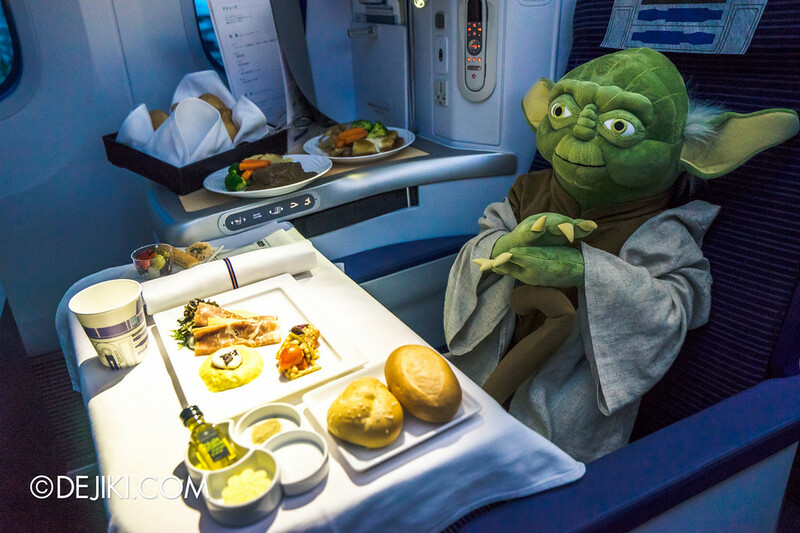 Though some of crew members might be secretly in the Jedi Order. 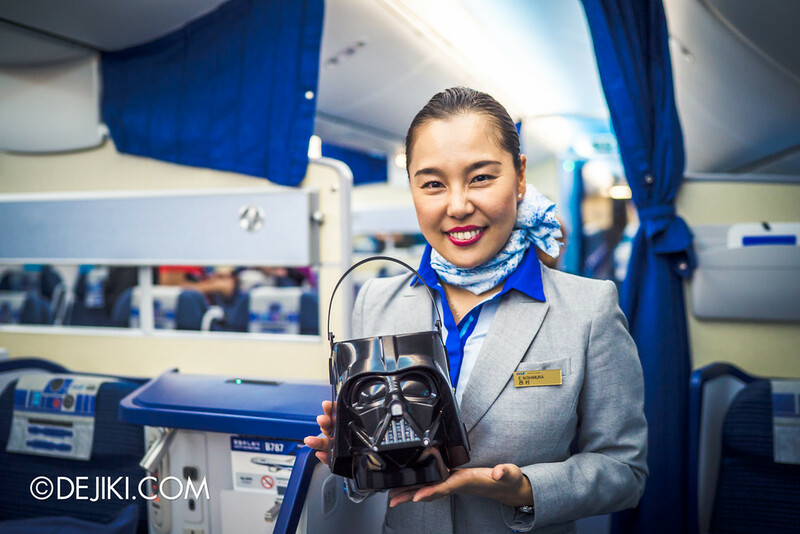 Maybe some day there will be themed ANA Jets flying regularly from Singapore? 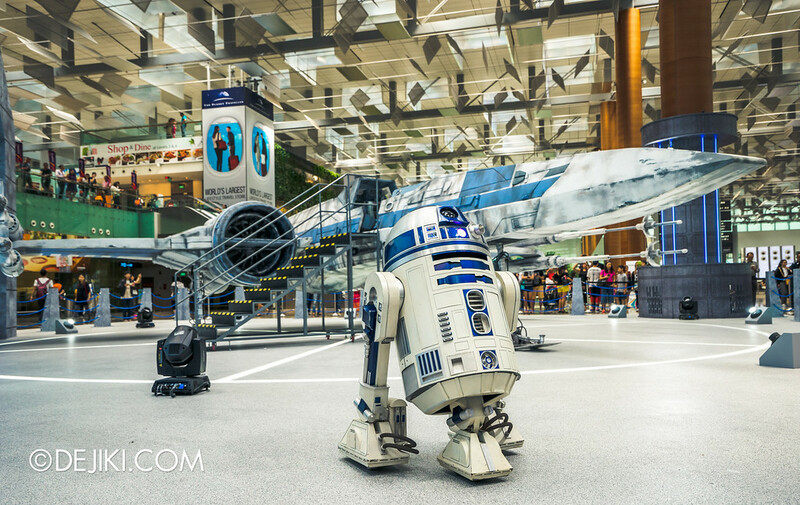 Hop over to the Star Wars at Changi to find out what’s happening at Changi Airport. You’ll get to see the X-Wing Fighter, TIE Fighter and more!